Amy Johnson Crow, of No Story Too Small continues the challenge to the geneablogging world to write a blog post weekly on one ancestor. This could be a photo, a story, biography, or a post on the weekly theme. 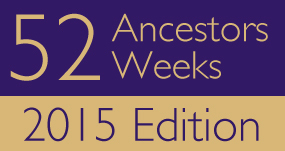 To read her challenge please go to Challenge: 52 Ancestors in 52 Weeks – 2015 Edition. Feel free to join in at any time! Week number four’s challenge is “Closest to your birthday” and is about an ancestor who shares the same birth month and day. The first ancestor that comes to mind is my great-grandmother, Frances V. Ogan, who was the mother of my paternal grandmother, Ella Maria House. I have written about Frances before in Mystery Surrounding Frances V. Ogan. She was born exactly 115 years before me. Unfortunately, I don’t have any new information about her that could solve the mystery. She is the only direct ancestor who shares my birthday. Other collateral relatives that I share a birthday with include a close family member; my first cousin on my dad’s side; a second cousin on my dad’s side; and Orlow Barnes – my third cousin once removed on the Johnson side (maternal) of my family. One direct ancestor died on my birthday – Anna Burnham. She was born abt 1644 and died in 1722. She married Samuel Gaines on May 1, 1668 probably in Massachusetts. Anna and Samuel were my 7th great-grandparents. There were no marriages reported among my direct ancestors that occurred on my birthday. In summary, since Frances V. Ogan is the only direct ancestor that shares my birthday, perhaps that is why I feel I must leave no stone unturned in order to figure out her origins. 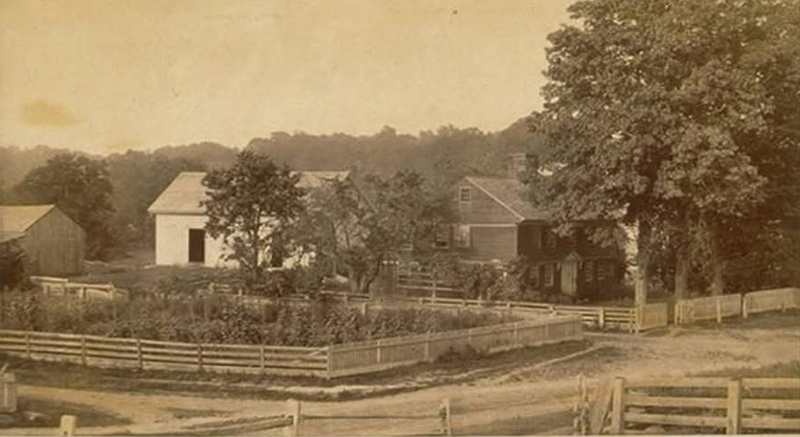 The John Hollister House in Glastonbury, Connecticut was built about 1649 according to “The HIstorical Society of Glastonbury” (Architecture page). It is located at 14 Tryon Street. This was the ancestral home for the Hollister family for many generations. Lieutenant John Hollister was born in 1612 in England and came to America around 1642 (1). Lt. Hollister married Joanna Treat, daughter of Richard and Joanna Treat, and eight children were born to this union: Elizabeth, John Jr, Thomas, Joseph, Lazarus, Mary, Sarah, and Stephen. Hollister Sr. died after April 3. 1665 and left a will naming his widow and living children and the children of daughter, Elizabeth. His burial location is unknown. John and Joanna Hollister are my 8th great-grandparents through their son, John Jr. He married Sarah Goodrich and through their son Thomas who married Dorothy Hills. Their daughter, Hannah Hollister, married William House and through their son, my 4th great-grandfather, Lazarus House. He married Rebecca Risley and their son, Allen House, married Editha Bigelow. Their son, Florus Allen House, married Julia Ann Lewis, and their son, James Emory House, was the father of my paternal grandmother, Ella Maria House, with his second wife, Frances Virginia Ogan. My House and Hollister ancestors all lived in Hartford, Connecticut since the mid-1600’s. They were founders of Wethersfield and many are buried in the Ancient Burying Ground in Hartford county. I would like to visit the area to walk the same places they did; view the historical John Hollister House; and pay my respects to all my many times great-grandparents in the cemeteries there. (1). The Hollister Family of America: Lieut. John Hollister, of Wethersfield, Conn., and His Descendants; Case, Lafayette Wallace; 1886; Fergus Printing Company; p 19; Digitzed 19 Sep 2006; American Libraries; Internet Archive.